The Highway Trust Fund assists states with maintenance and construction projects. Chiotti, whose boss serves on the House Transportation and Infrastructure Committee, said he hopes the Highway Trust Fund gets included in conversations surrounding reauthorization of the 2015 Fixing America’s Surface Transportation Act. The FAST Act authorized billions for surface transportation projects. Improvements in vehicle fuel economy and shifting driving habits have contributed to the fund’s steady decline, prompting several general fund transfers in recent years to maintain its solvency. “I think, at this point, it’s pretty unlikely that something happens this year on the Highway Trust Fund,” Chiotti said. President Donald Trump’s proposed infrastructure plan places an onus on state and local government agencies to raise funds. The plan’s funding principles, unveiled Feb. 12, would rely significantly on nonfederal funds to reach a $1.5 trillion top-line goal over 10 years. Overall, $200 billion in direct federal funds would be sought to achieve the plan’s desired top line. 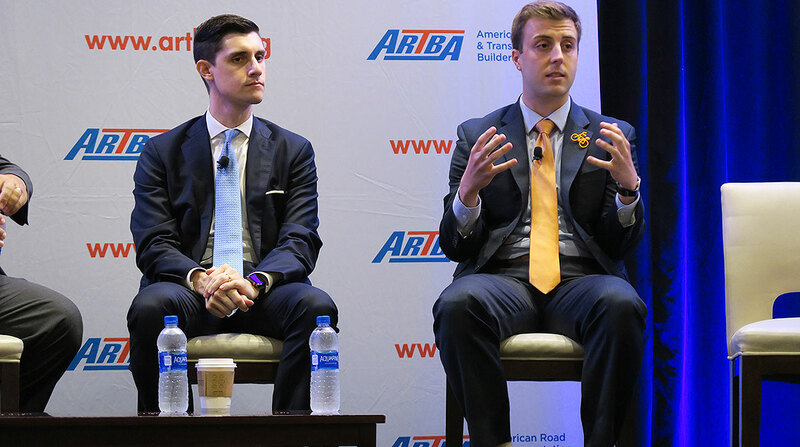 Jon Bosworth, legislative assistant for Rep. Earl Blumenauer (D-Ore.), recommended an increase to the fuel tax as a way to boost transportation funding. The federal fuel tax, which supports the Highway Trust Fund, has stagnated at 24.4 cents a gallon for diesel and 18.4 cents a gallon for gasoline since 1993. Bosworth also cited the need for more experts to educate members of Congress on transportation funding, noting that only one House Ways and Means Committee hearing in the last 7½ years has touched on the subject. Chiotti emphasized the importance of diversifying funding mechanisms, such as imposing fees on electric vehicles or cargo loads. Public-private partnerships, or P3s, can also lighten the load for state and local governments looking for ways to pay for transportation projects, according to Bosworth. P3s make up a key element of Trump’s infrastructure plan. Bosworth noted, in fact, that Blumenauer sees a gas tax increase as just a placeholder solution; ultimately, the congressman believes the tax should be replaced by a miles-based user fee. The MBUF system tabulates how far a vehicle has traveled and charges the vehicle based on that distance. Before nationwide deployment, however, Bosworth said the MBUF model would need to be tested extensively at the state level. He even compared it to the gas tax, pointing out that states introduced the taxes individually before the federal government imposed one in the 1930s. Several states, including Delaware, Washington, Hawaii, Minnesota, Colorado and California, have conducted pilot programs to test the MBUF.